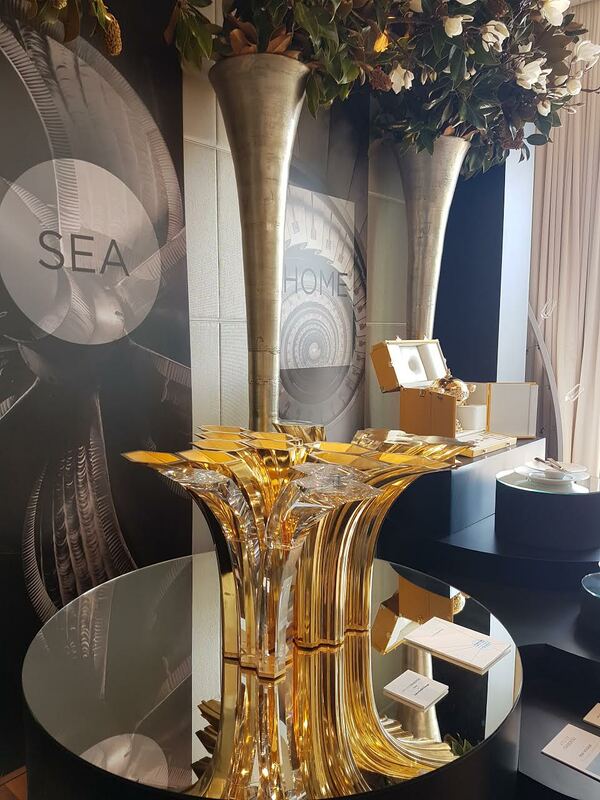 Part showcase, part discovery suite, the House of Excellence were on display during the Monaco Yacht Show in the Private Dining room Boutsen Design outfitted for the Yacht Club de Monaco. The collaboration between Boutsen Design and Boeing Business Jets highlights and celebrates Boutsen’s illustrious reputation in aviation. Having now for a couple of years brought her savoir-faire to the yachting and residential worlds she decided for this occasion to bring together the best in these industries as well as masterpieces by her close partners. Guests were able to view for the first time in Monaco masterpieces such as the late Zaha Hadid’s Crista for Atelier Swarovski. Crista was created in crystal and 24-carat gold-plated metal takes as its starting point an investigation into the process of crystallization occurring in nature. The sculptural design showcases Swarovski’s innovative Wave Cut technology, which allows curved lines to be cut in crystal for the first time. Another showstopper will be the Mini Voyage chandelier, a scaled down version of the original one conceived by Yves Béhar for Swarovski Crystal Palace. The form is an allegory to the continuous movement that travel represents and an ideal representation of the seamless relation between the aviation and yachting worlds that the House of Excellence is highlighting. Also on display, and avant-premier of Trocadéro, the newest collection by Odiot which this year has the honor of having their own exhibit at the Musée des arts décoratifs in Paris with the exposition titled “Dessiner l’or et l’argent, Odiot orfèvre (1763-1850)”. The 18K rose gold gilded pieces with art deco inspiration are delicately crafted keeping in tradition with their historic craftsmanship. Other famous brands bringing special pieces to the House of Excellence are Alberto Pinto Design, Baccarat, Loro Piana Interiors, Foglizzo, Saint Louis, an the design-forward outdoor collection by Tribu. Boutsen Design’s collaboration with some of the best companies around the world is in evidence in this arrangement of unique design pieces that can be the extraordinary final touch in a yacht, residence or aircraft. “It makes sense for me to do a showcase with a well known name in Aviation during the Yacht show as both industries are part of the same lifestyle. I have always wanted to find a way to bring it all together to show that whether you are on your plane, yacht, or home we provide unique, seamless, bespoke service for our clients” explains Daniela Boutsen. solutions together with a professional service that is unsurpassed in the world today. Atelier Swarovski offers cutting-edge jewelry, accessories and home décor items which are the ultimate expression of Swarovski crystal. Pushing the boundaries of creativity, it collaborates with the finest talents in the world across fashion, jewelry, architecture and design. Atelier Swarovski presents seasonal jewelry and accessories collaborations twice a year during New York, London and Paris fashion weeks alongside its constantly evolving Core Collection. Atelier Swarovski Home, launched at Milan Design Week in April 2016, consists of functional and decorative objects for the home. Atelier Swarovski was founded by Nadja Swarovski in 2007 as a showcase for creativity, craftsmanship and the art of crystal cutting and crystal innovations. Past collaborators include Jean Paul Gaultier, Viktor&Rolf, Christopher Kane, Maison Margiela and Mary Katrantzou for jewelry, and Zaha Hadid, Daniel Libeskind and Ron Arad for home décor. Founded in 1690, Napoleon and the Splendor Empire period marked the beginning of a glorious chapter for the House of Odiot receiving many prestigious orders from the Emperor and his family, such as Napoleon’s coronation sword and scepter, the magnificent cradle for the King of Rome.The House of Odiot is proud of its exceptionally rich heritage, marked by encounters with great historical figures, and this heritage is a source of inspiration and encouragement in the continual search to produce the most beautiful, perfectly executed objects.